Miami Trace senior DeAndre Pettiford drives past a defender from Athens on the way to the basket during a Division II District semifinal game at the Convocation Center in Athens Thursday, March 2, 2017. Miami Trace senior Blake Pittser takes the ball to the basket during a Division II District semifinal game against the Athens Bulldogs at the Convocation Center on the campus of Ohio University in Athens Thursday, March 2, 2017. Miami Trace head coach Rob Pittser calls the play in the huddle during a Division II District semifinal game at the Convocation Center in Athens Thursday, March 2, 2017. 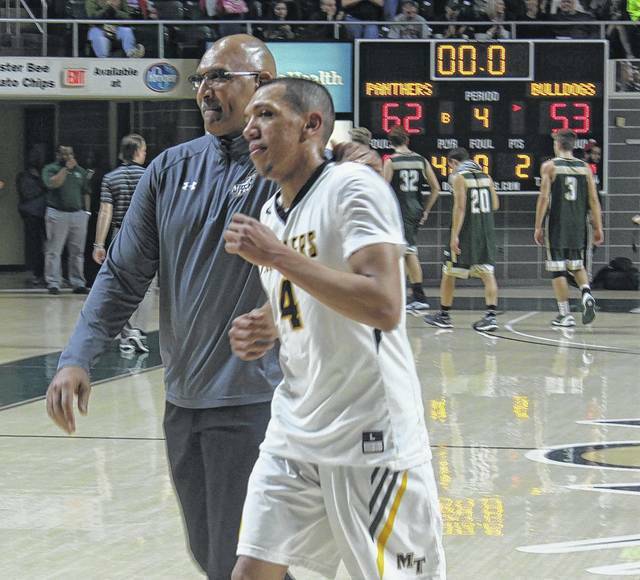 Miami Trace senior Tyrae Pettiford walks off the floor with assistant coach Mychal Turner following a 62-53 victory over the Athens Bulldogs in the Division II District semifinals Thursday, March 2, 2017 at the Convocation Center at Ohio University. Miami Trace junior Cameron Carter drives to the basket while guarded by Athens junior Treyce Albin during a Division II District semifinal game at the Convocation Center in Athens Thursday, March 2, 2017. 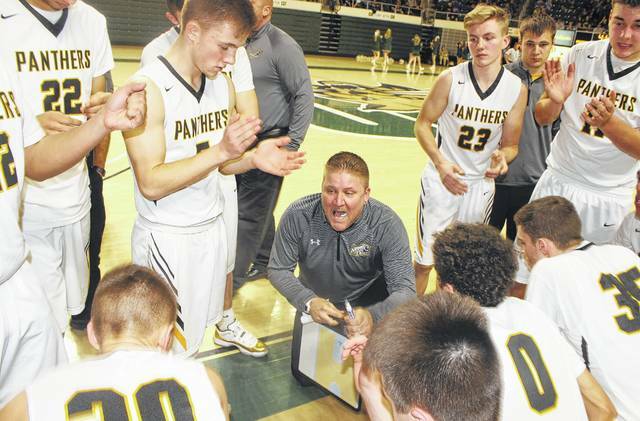 ATHENS — The Miami Trace Panthers made their second appearance in as many years in the Division II District semifinals at the Convocation Center on the campus of Ohio University Thursday night. 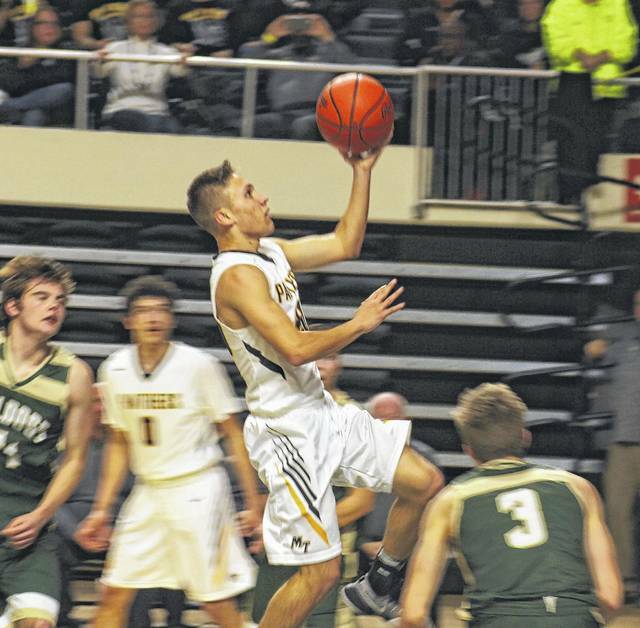 Last year, the Panthers lost in the semifinals to Fairfield Union, 49-44. Last night, Miami Trace defeated the Athens Bulldogs, 62-53 to advance to the District championship game back at the Convo Wednesday, March 10, when they will take on, for the second time in as many years, Fairfield Union. The Falcons defeated the Chillicothe Cavaliers Thursday, 61-44, preventing a boys’ version of the girls’ District finals on Tuesday that featured the Miami Trace Lady Panthers taking on, and defeating, the Lady Cavaliers of Chillicothe High School. Thursday, Miami Trace (now 21-3) broke open a close game with a 21-11 third quarter on their way to the victory. Athens ends their season with a record of 14-10. Miami Trace senior DeAndre Pettiford was the game’s leading scorer with 22 points. Senior Tyrae Pettiford had a double-double with 10 points and 10 rebounds; junior Cameron Carter had nine, junior Darby Tyree had nine, senior Mitchell Creamer scored eight points and senior Blake Pittser scored four and led with four assists. 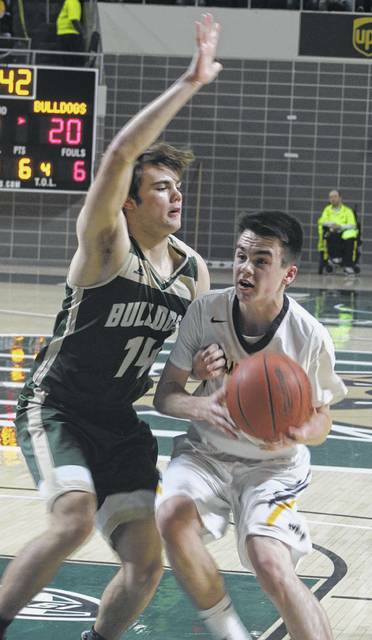 For the Bulldogs, junior Dalton Cozart led with 13 points, including three threes. Senior Griffin Lutz and sophomore Logan Mazfield both scored nine points; sophomore Eli Chubbs scored seven, sophomore Justin Hayes had seven, junior Micah Saltzman scored six and junior Robert Dickleman had two points. “We thought the pressure would be good to us tonight,” Miami Trace head coach Rob Pittser said. “In terms of the match-ups that we had. We hadn’t really gone with a lot of consistent, trapping defense. “The pressure was good to us in the third quarter, especially,” Pittser said. “It enabled us to build a little bit of a lead. “They were in a kind of amoeba, unstructured, trapping 2-3 alignment and there really wasn’t any pattern to run against,” Pittser said. “So, we just told our guys to keep the floor spread, stay in the corners with one guy in the middle and we got some easy drives to the bucket during that stretch. “We’re really difficult to guard,” Pittser said. “If you have to press up on our ball-handlers, we just have enough speed and quickness. DeAndre got to the bucket several times and had a huge game for us. Pittser scored the first basket of the game for the Panthers. Tyrae Pettiford made it 4-0 with 6:35 to play in the first quarter. Back-to-back threes by Cozart, sandwiched around a bucket by Tryee, tied the game 6-6. The lead changed hands a couple of times before the quarter ended with the Panthers in the lead, 13-11. The Panthers had a three from Tryee and a basket from DeAndre Pettiford to take an 18-11 lead. Mitchell Creamer hit a couple of buckets to help give the Panthers a 22-14 lead with four minutes remaining in the first half. Athens pulled back to within two points, 23-21. DeAndre Pettiford scored late in the half to bring the tally to 25-21, in favor of the Panthers, at the intermission. Athens scored the first seven points of the third quarter to go in front, 28-25. DeAndre Pettiford scored and then scored again, slashing his way to the basket. The Panthers went on a 10-0 run, including a basket by Carter off a long, three-quarter court pass from Tyrae Pettiford. Miami Trace began to apply full-court pressure and that paid dividends. Later in the third, Pittser tossed up a pass to Tyrae Pettiford for a basket. Carter hit a short jumper in the lane that made it 39-30, Panthers with 2:33 to play in the third. 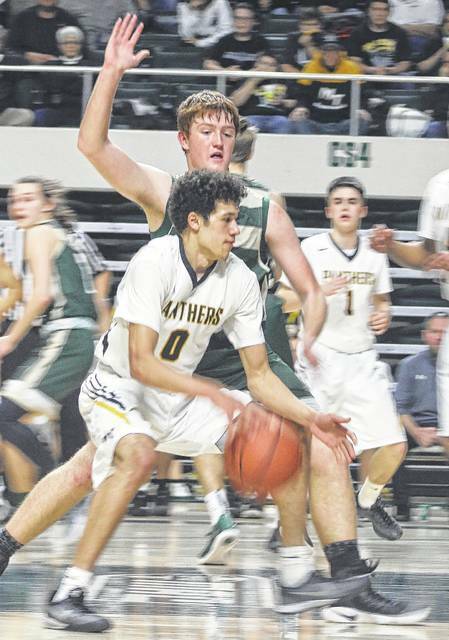 DeAndre Pettiford converted an old-fashioned three-point play and a goal-tending call when an Athens player grabbed the rim during a shot by Pettiford, pushed the Panthers’ lead to 46-32 at the end of the third. The fourth started with a basket from Creamer and a 16-point Panther lead. Another basket by the Creamer lifted the Panthers to a 52-37 lead near the six-minute mark. Miami Trace still had a 16-point lead with roughly three minutes to play. After a three by Athens, Tryee had a tremendous slam dunk. The ball hit the floor and bounced nearly 20 feet into the air. Athens twice got to within 11 points and hit the final basket of the game to end the score at 62-53. The Panthers made 27 of 55 shots attempts for 49 percent. Athens was 19 of 49 for 38 percent. Miami Trace made 1 of 9 threes for 11 percent. Athens hit 6 of 17 from behind the arc for 35 percent. Tickets for the Miami Trace-Fairfield Union District championship game will be on sale Friday at Miami Trace H.S. from 9 a.m. until 3 p.m. and next week, Monday through Thursday, from 9 a.m. until 3 p.m. and Friday, March 10 (the day of the game) from 9 a.m. until noon. The game is at 6:15 p.m. on the 10th. The Miami Trace Lady Panthers will be playing the winner of the Minerva-New Philadelphia game on Tuesday, March 7 at 6:15 p.m. in the Regional semifinals at Zanesville High School. Tickets are on sale toFriday and Monday, from 9 a.m. until 3 p.m. and again Monday evening from 6-7 p.m. and then Tuesday, March 7, from 9 a.m. until noon. Tickets are $6 and the school gets to keep a portion of the proceeds from all pre-sale tickets. MIAMI TRACE —DeAndre Pettiford 9-4-22; Cameron Carter 4-1-9; Skyler McDonald 0-0-0; Tyrae Pettiford 4-2-10; Mitchell Creamer 4-2-8; Seth Leach 0-0-0; Blake Pittser 2-0-4; Darby Tyree 3 (1)-0-9; Tiante Connell 0-0-0; Jacob Batson 0-0-0. TOTALS — 26 (1)-7-62. Free throw shooting: 7 of 12 for 58 percent. Three-point field goal: Tyree. Combined field goal shooting: 27 of 55 for 49 percent. Three-point field goal shooting: 1 of 9 for 11 percent. Rebounds: 25 (8 offensive). Bench points: 17. Second chance points: 4. Points off turnovers: 8. Assists: 11. Steals: 9. Blocks: 4. Turnovers: 11. Personal fouls: 12. ATHENS — Micah Saltzman 0 (2)-0-6; Griffin Lutz 3-2-8; Austin Koska 0-0-0; Robert Dickelman 1-0-2; Henry Gerig 0-0-0; Treyce Albin 0-0-0; Dalton Cozart 2 (3)-0-13; Logan Mazfield 3-2-8; Eli Chubbs 2 (1)-0-7; Justin Hayes 1-5-7; Nathan Whitehead 0-0-0; Trey Martin 1-0-2. TOTALS — 14 (6)-9-53. Free throw shooting: 9 of 12 for 75 percent. Three-point field goals: Cozart, 3; Saltzman, 2; Chubbs. Combined field goal shooting: 19 of 49 for 38 percent. Three-point field goal shooting: 6 of 17 for 35 percent. Rebounds: 27 (8 offensive). Assists: 9. Steals: 2. Blocks: 1. Turnovers: 18. Bench points: 17. Second chance points: 15. Points off turnovers: 6.